Living deep within the tropical rain forests of Central and South America, there exists a family of over 165 different types of Dendrobatid frogs (arrow-poison frogs). These frogs secrete a poisonous cocktail of potent lipophilic alkaloids from the granular glands located on their back, which form some of the deadliest natural toxins known. In this way, these chemical compounds act as a defence mechanism for the frog by killing any predators which come into contact with the frog. For centuries now, native Ecuadorian Indians have used these frog-derived toxins as a hunting weapon, dipping the ends of their arrows and blowgun darts in this poison. More..
Tree frogs are frogs of the family Hylidae. There is large variation within the tree frogs. Many of the arboreal frogs are green in colour, whereas the terrestrial and aquatic species are duller. They mostly feed on insects, however some of the larger species can feed on small vertebrates. Many of the tree frogs are not arboreal and can be terrestrial or aquatic. The species within the genus Cyclorana are burrowing frogs, sometimes spending many years underground. More.. The first thing you are bound to notice on this amphibian are the bold, bright red eyes. This frog, as an adult, is brightly colored all over. The body is predominantly neon green but it is usually splashed with other colors like blue or yellow. The upper legs are usually bright blue and the feet are orange or red. The coloration of this tree frog is definitely eye catching. 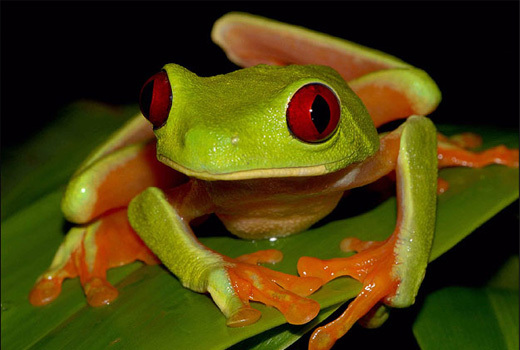 The Red-eyed tree frog can change its color with its mood from a darker green to a reddish-brown. These tree frogs have suction cup toe pads. In this frog, males are smaller than the females. Males usually reach a length of about 2 inches while females are usually 3 inches in length. 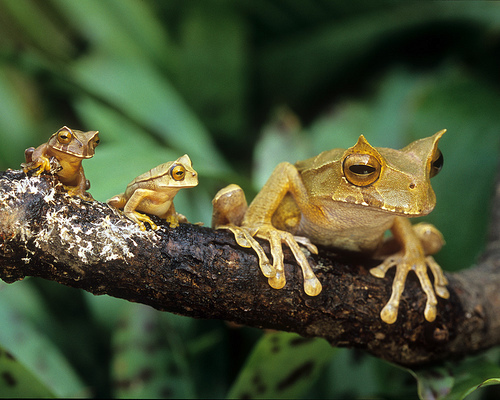 These frogs live in a neotropical environment. They prefer the lowland rainforest areas close to rivers and the adjacent hills. These frogs are carnivores and feed primarily at night, feasting on crickets, moths, flies, grasshoppers, and sometimes even smaller frogs! Basically, they will eat any insect or food item that they can fit into their mouths. In captivity, babies eat mostly fruit flies and pinhead crickets. More.. These frogs that can grow to 4,5 cm in size at most. Historically, tree frogs were used as barometers because they respond to approaching rain by croaking. In the breeding season, even when migrating to their mating pools, they croak as well. Depending on subspecies, temperature, humidity, and the frog’s ‘mood’, skin color ranges from bright to olive green, gray, brown and yellow. The head is rounded, the lip drops strongly, the pupil has the shape of a horizontal ellipse and the eardrum is clearly recognizable. Males can be distinguished from females by their browny-yellowy, large (folded) vocal sacs in the throat region. The amplexus is axillary (in the armpits). Both adult males and females reach sizes up to 30-40 mm, rarily longer than 45 mm. The smooth, shining, usually leaf-green back and the white-yellowish to gray belly are separated by a dark stripe on its flank reaching from the nostrils, over the eye and the eardrum, to the groin, contrasting the green, and forming a dark spot near the hips. The hind legs are much larger and stronger than the fore legs, which enables to jump rapidly. More..
the scientific name of tree frog ia Hula faber. it also knoen as poison dart frog.